My family loves Costa Rica. My husband and I were married there, and have been back multiple times with and without our kids. It’s a great place to travel with children: safe, relatively easy to navigate, and filled with friendly people. If you haven’t been yet, go! 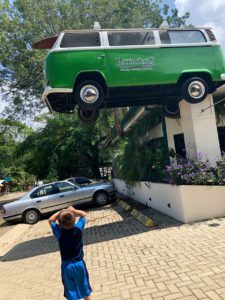 I consider Costa Rica to be one of the best global destinations for family travel, but your vacation will be even better with a little preparation. 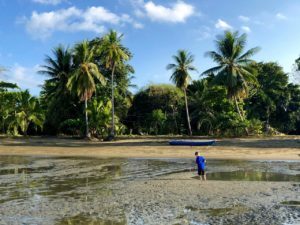 Here’s some advice to get you off on the right foot when planning your trip to this jewel of Central America. Don’t stay in a big resort. Save that for other, easier-to-reach tropical destinations. By avoiding large American or European resorts, you will see much more of the real Costa Rica. There are innumerable charming little inns, ecolodges and VRBO rentals; a little internet research will help you find exactly what you are looking for. Need a pool? Want to be on the beach? Want a completely self-sustainable, off-the-grid experience? Costa Rica has it all. On our last trip, we tried out Rancho Margot and Rafiki Safari Lodge and both were amazing. Don’t panic about packing. Yes, things are harder to find in rural locations, but diapers, for example, are easily located (and cheaper!) than here in the US. Sure, pack plenty of supplies — but don’t panic. Don’t think it’s going to be super cheap. While still considered a developing country, Costa Rica is popular with foreigners, and that has driven up prices. I still think it’s far more affordable than Hawaii, but the cost of food was comparable to home for us. Don’t try to see everything. First of all, it’s impossible. Costa Rica has a Caribbean coast and a Pacific coast, separated by mountains, and it’s really not feasible to see both sides of the country in one short vacation. It also has a gorgeous lake/volcano region north of San Jose, the Monteverde cloud forest (a temperate rainforest), the drier Nicoya Peninsula up north and the spectacular Osa Peninsula down south. Plus, there’s the highly surfable long stretches of beaches in between, and dozens of natural parks and protected areas. Ask yourself: Do we want to relax on the beach? Swim in a pool every day? Learn to surf? Fish? Snorkel? See sloths? Hike? Sit in hot springs? See a rainforest? You WILL have to prioritize. Just one of the many critters at Neofauna. Don’t plan a packed itinerary with guided tours. I’m not inherently opposed to guided tours; there are lots of amazing Costa Rican guides, and if you’re going to someplace new, why not have an expert show you around? However, it’s very easy to book tours/events while there, with a couple days notice and a Wi-Fi connection at your hotel. If you plan everything ahead of time, you may miss out on the best surprises your adventure has to offer. For example, when we took our four-year-old and two-year-old, the highlight of our whole trip was NeoFauna, which turned out to be a little wildlife conservation place full of snakes and poison dart frogs and butterflies, with an enthusiastic young employee who took them all out, let us hold them, and told us why the creatures we were holding couldn’t kill us. You know what’s super super SUPER cute? 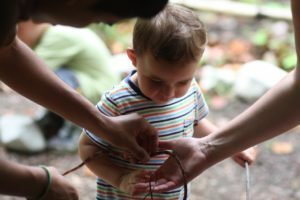 A toddler holding a tree frog. We only found this place because we happened to be driving past a hand-painted sign advertising it just as we needed to stop; somebody was screaming (or maybe had to go potty? ), and we pulled over. My other issue with a packed itinerary is that most kids (or maybe just mine?) require a fair amount of downtime. If you just roughly plan out your itinerary and then play it by ear, you have the freedom to, say, suddenly take your five-year-old to a surfing lesson the morning after he informs you that he wants to learn to surf. And suddenly he’s the male version of Blue Crush. Now you and your husband can spend an hour of the flight back arguing over whether or not you are going to encourage this newfound passion, which could easily end in your son living in a tent on a beach in Hawaii. Yeah, this is right about where that SUV comes in handy. Bring water bottles and drink the water. It’s perfectly safe, and trust, me, you don’t want to be the tourist littering the planet with plastic while visiting the ecolodge center of the world. Bring lots of sunscreen. Preferably the mineral kind, not the chemical kind that kills coral reefs. Make sure you are up to date on appropriate vaccines. But don’t worry too much about health concerns. I think it always makes sense to visit the CDC’s Yellow Book on travel health before I take my family anywhere. However, there’s little to no malaria, the food and water supply is pretty safe, and Costa Rica has a very good medical system with excellent doctors, should you need to visit a hospital. Rent an SUV. This is really expensive in Costa Rica due to taxes and required insurance. You may be able to avoid it if you are staying in just one place and take a shuttle there. 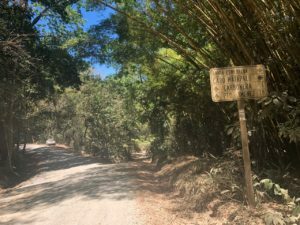 However, driving isn’t too bad outside of San Jose, and with kids and all the requisite STUFF they seem to require the best way to see the country is definitely with a little courage and your own vehicle. With full coverage insurance and 4WD. Seriously: think potholes, dirt roads, river crossings, rainy season, sandy beaches…just do it. Sometimes those little must-see moments are things you’d never guess they’d be back home. Make sure you have a good map, and some kind of cell service for GPS, and give yourself plenty of time to get in and out of San Jose. My husband has been there more times than he has been willing to count and still got lost the last time we tried to find our rental car return location, almost missing our flight. Traffic is horrible in San Jose…like every other capital city. Have both dollars and colones (the local money) on hand. Most places will take dollars — even vendors on the street (for a slightly higher price) EXCEPT the highway toll booths. You will need local coins for that. Try all the local delicacies. Papa fria roadside stands are all over the place — this is coconut water, and it’s better fresh from the coconut than in those packages at Safeway. Roadside ceviche initially slightly concerned us, but we love ceviche, and while I always eye the cooler suspiciously, it’s always been amazing (and we’ve never gotten sick). Gallo pinto is the national food, a rice and beans mixture, with everyone’s recipe slightly different. Soda is the term for the ubiquitous little local restaurants that serve “typical food” or comida tipico. This is usually a plate with chicken or beef or fish, gallo pinto and plantains. If you ask, lots of places may have a tortilla or two and with that combination I can usually find something my kids will eat. 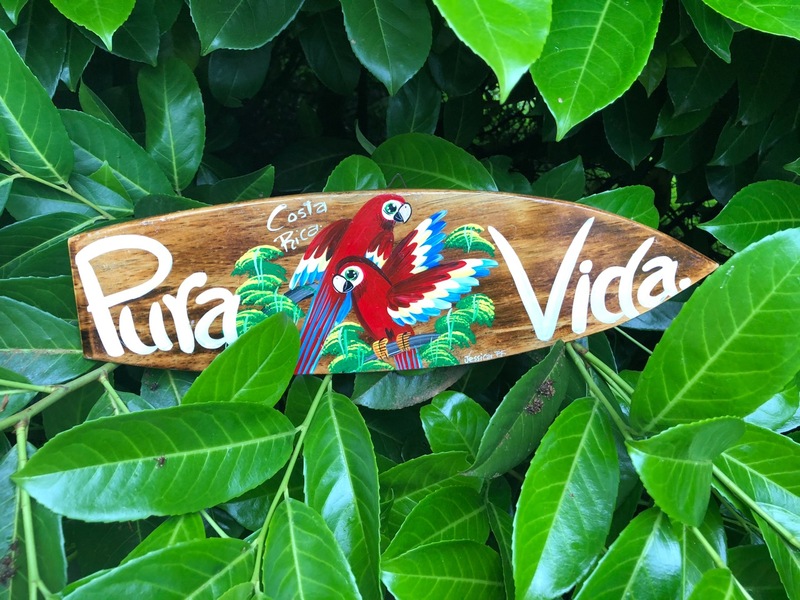 Embrace Pura Vida! Relax and have fun. 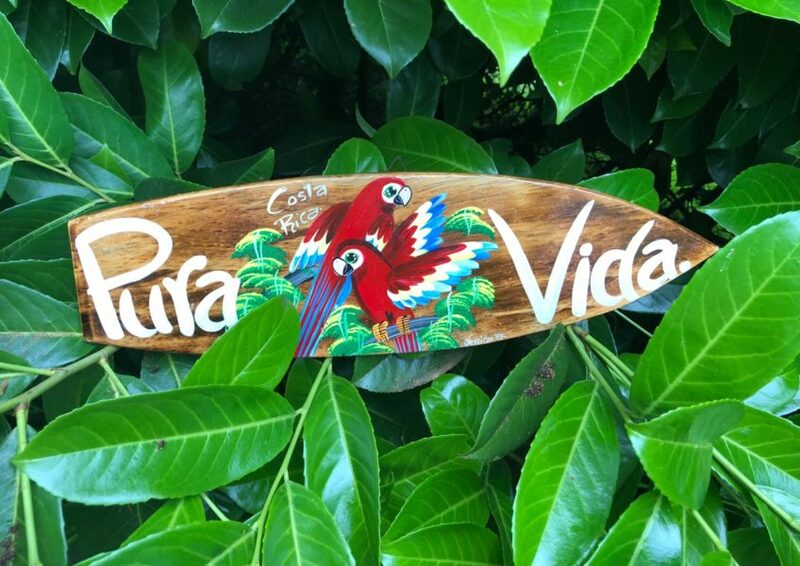 Pura vida translates to “pure life” and encourages a generally happy, relaxed, no-worries kind of attitude. On our last trip, I finally bought a sign to hang on my wall when I got home as a constant reminder to try and keep that Costa Rica feeling all year round. If you’re looking for a family vacation with adventure, relaxation and something for everyone, Costa Rica really is a great choice.